DBIA recently worked with market sector experts and other industry trade groups to develop design-build best practices related to three specific markets: federal, water/wastewater and transportation. This effort resulted in the release of a new document, “Water/Wastewater Design-Build Best Practices,” in December 2015, in collaboration with the Water Design-Build Council. It offers detailed guidance on how to put design build best practices and techniques to work efficiently and effectively in the water/wastewater market. Prepared by DBIA’s Water/ Wastewater Markets committee, the document’s chief authors were Michael Loulakis, Esq., DBIA, president and CEO of Capital Project Strategies LLC, and Douglas Herbst, DBIA, collaborative project delivery advisor for Freese and Nichols Inc. Herbst served as vice chair of DBIA’s Water/Wastewater Markets committee during the production of the water-specific best practices document. In a recent interview, Herbst provided insight into specific elements of the document in the following Q&A. Water sector interest in non-traditional construction procurement methods has grown substantially over the past decade. 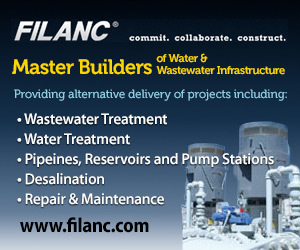 Aging systems, regulatory issues, and capacity demands are requiring public and private water utility owners to employ delivery methods that provide quicker delivery times and higher quality solutions and results, as well as earlier knowledge of construction costs. Owners are more often turning to alternative delivery approaches, including design-build. With One Week Left for conference Early Bird rates, the 2016 Design-Build for Water/Wastewater Conference, hosted by DBIA, AWWA, WEF and WDBC, is the only event dedicated to enhancing the use and delivery of design-build in the water and wastewater sector. The event will take place April 20-22, 2016, in the Charlotte Convention Center in Charlotte, N.C. In addition to networking with over 900 key players and decision-makers here are the top three reasons for joining DBIA and our partners in Charlotte this Spring! “If not for design-build, the project may not have advanced as it did,” said James Avitabile, P.E., DBIA, while discussing his reasons for supporting the project’s nomination for Excellence in Engineering. “The design-build team used a high degree of innovation to develop a new interchange layout that improved traffic operations and level of service, reduced the structure height and improved aesthetics. While achieving each of these benefits, the overall cost was reduced and the North Carolina DOT was pleased with the results. A project outcome like this is exactly what design-build is all about." Just another reason you should consider attending DBIA’s Design-Build for Transportation Conference in Charlotte. New York State’s authorization of design-build contracting in 2011 was limited and did not extend to local governments; New York City officials, including the Mayor, NYCDOT Commissioner, and Budget Director, have asked the Legislature to grant the City this authority. The legislature should honor this request and include design-build authority for NYCDOT in the budget bills. The State’s experience indicates that NYCDOT can benefit significantly from design-build by completing a greater number of projects on time and on budget. If it realized savings on par with the State’s experience, the City could save $2 billion over 10 years. Maryland Democrats on Tuesday announced a transportation agenda designed to shed light on funding decisions and make suburban jobs more accessible to workers who live in cities and don’t own cars. The legislative package, unveiled by House Speaker Michael E. Busch (D-Anne Arundel) and Senate President Thomas V. Mike Miller Jr. (D-Calvert), would also require the state to replace an aging and frequently congested Potomac River bridge crossing in Southern Maryland and create a citizen-oversight board for the Maryland Transit Administration. City and county leaders are seeking permission to pursue a more flexible, multi-stage approach to fixing the Allegheny County Sanitary Authority’s wet weather sewage overflow problems that focuses on a $1 billion treatment plant expansion and utilizing “green infrastructure” improvements. Some states, recognizing the economic and environmental costs of such delays, are starting to use financial incentives, heightened public scrutiny and design-build strategies to increase the likelihood that projects will come in on time and on budget. This article from Pew Charitable Trusts looks at several projects and their progress. Flint Mayor Karen Weaver on Tuesday outlined an estimated $55-million public works project expected to begin within a month to remove Flint's lead-contaminated pipes from the water distribution system. First priority will be given to high-risk households with pregnant women and children, Weaver said at a news conference at City Hall. Lansing Mayor Virg Bernero has offered technical assistance from the Lansing Board of Water and Light. Lansing has removed about 13,500 lead pipes in the city. The Fast Start plan will require extensive coordination between city, state and federal officials, Weaver said. She was joined Tuesday by retired National Guard Brig. It’s a type of contract that concerns some people. But it’s also a deal that governments continue to make across Canada and around the world. On Wednesday, Niagara Regional councillors were presented with information about public-private partnerships. Cleaning so much wastewater is a multi-stage process that requires 900 acres of land. The plant, with its tanks, concrete towers, underground passageways, and miles of pipes was built in the early 1980’s. Every day, it treats enough sewage to fill 227 Olympic-sized swimming pools. And almost all of it ends up in the Sacramento River. This year, the January river flood was months earlier than expected and has led to significant shoaling in the Head of Passes and Southwest Pass. That shoaling, or underwater accumulation of dirt, will continue for as long as the water in the Mississippi River is elevated. On Jan. 14, the Associated Branch Pilots of the Port of New Orleans reduced the allowable draft of vessels — how far they extend below the surface of the river — from 47 feet to 43 feet. That draft restriction was reduced again Jan. 29 to 41 feet, according to the industry group Big River Coalition. At the end of the two-year preliminary engineering contract, the 6-10 project will be 30 percent designed and the consultant will help the state seek bids for a contractor to build the project under a design-build contract. The contract limits the consultant to charging no more than 125 percent of overhead. June 14-15, 2016, SAME’s Savannah Post is co-chairing an Industry Day. All the southeastern Corps of Engineers offices, NAVFAC Southeast, the Georgia Port Authority and the Department of Transportation will be briefing their FY 2017 contracting opportunities. For information, contact Sally Riker at 770-857-8426 or Gwen Parker at 912-704-3526. “In my opinion, the future of construction technology all comes down to analytics because we have such a workforce shortage right now,” says Dustin Burns, IT director with Kansas-City-based general contractor McCownGordon Construction. "And there’s so much waste in construction when you compare it to healthcare and manufacturing, the focus is going to be on becoming as efficient as possible in construction. Major pipeline industry associations on Feb. 18 announced their support for a program to ensure that all pipeline inspectors doing work for the trade groups' members are certified by 2018. Texas engineers have developed a taller, heavier bridge rail to help prevent vehicles from rolling off overpasses. Now that the construction industry is finally in sustainable recovery, it's time to look beyond survival at how the industry can develop and grow. There are numerous challenges ahead. Does the solution to many of these challenges lie in technology? It seems likely. Let’s look at five trends that have the potential to transform the industry. One Week Left for 2016 Water & Transportation Conferences Early Bird Rates! Register now and save! The Early Bird registration rates for the 2016 Design-Build in Transportation Conference and 2016 Design-Build for Water/Wastewater Conference expire Friday, March 4. Both conferences are being held April 18-22 in North Carolina at the Charlotte Convention Center. Pricing will increase beginning March 5, so don’t delay! New member listing as of Feb. 22, 2016. Mar. 24, Young Professionals Presents Networking Happy Hour at Wynkoop Brewing Co.